Locations of Sunday's two robberies and a related car crash. 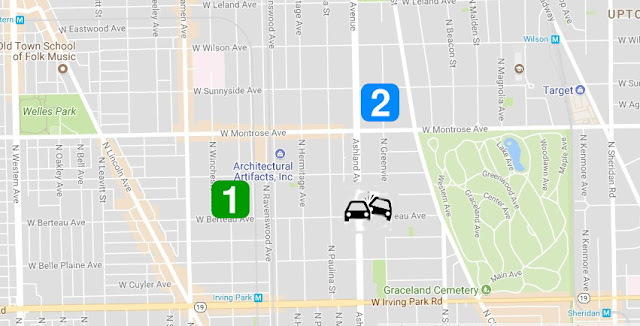 A pair of armed men robbed two delivery drivers then crashed a stolen car two blocks from Mayor Rahm Emanuel’s home and slipped away Sunday evening. It all played out in about an hour around Lakeview, Uptown, and North Center. Around 8:30 p.m., a driver for Chicago’s Pizza was robbed at gunpoint by two men in the 4200 block of North Winchester. The offenders took the man’s money and food, then fled westbound on Berteau from Damen, police said. About 30 minutes later, the same men used a handgun to rob another delivery driver in the 4400 block of North Greenview. The pair escaped with the victim’s food delivery, $120, wallet, and phone. Both victims said the robbers were black men in their 20’s who wore black clothing and masks. One of the offenders had dreadlocks. Finally, at 9:30, two men fled the scene after crashing their stolen Jeep into another car at Berteau and Ashland, just down the street from the mayor’s family home. The two men were last seen running eastbound on Berteau. One of the offenders may have been wearing a yellow patterned jacket in the second hold-up. Proceeds taken in at least one of the delivery driver robberies was found in the Jeep, police said. The car was stolen Friday in the 1200 block of West Wilson. No one was injured in last night’s robberies or in the car crash. Police are following several leads in the cases.